Today, all of the signs suggest we are in the midst of an inflection point in the M&A market. Currently, there are three main elements, or ingredients, that have transpired in today’s market and have positioned privately-held companies and their shareholders to yield extremely favorable returns if a liquidity event, or sale of their company is actualized. Those ingredients include: 1) the capital markets, 2) the current market cycle, and 3) the great wealth transfer. We are currently in the second longest bull market in history. As of March 9, 2018, the bull market reached its 9th birthday. High valuations, record low interest rates, and the amount of capital in the markets can all be attributed to this bull market. The longest bull market was 9 years and 7 months old (115 months) beginning in 1990 and ending in the dot-com bubble. In life, timing is everything, and it is no different in the M&A market. The M&A market, like seasons, goes through its cycles. On one end of the spectrum is a ‘seller’s market’ and on the other end of the spectrum is a ‘buyer’s market’. Source: Slee, Robert T. Private Capital Markets, Valuation, Capitalization, and Transfer of Private Business Interests. Publication. 31 May 2011. Today we are in a seller’s market, which means there is a higher demand for businesses for sale because of an excess supply of capital that needs to be invested – more dollars are chasing fewer deals. This results in higher valuations for the seller. 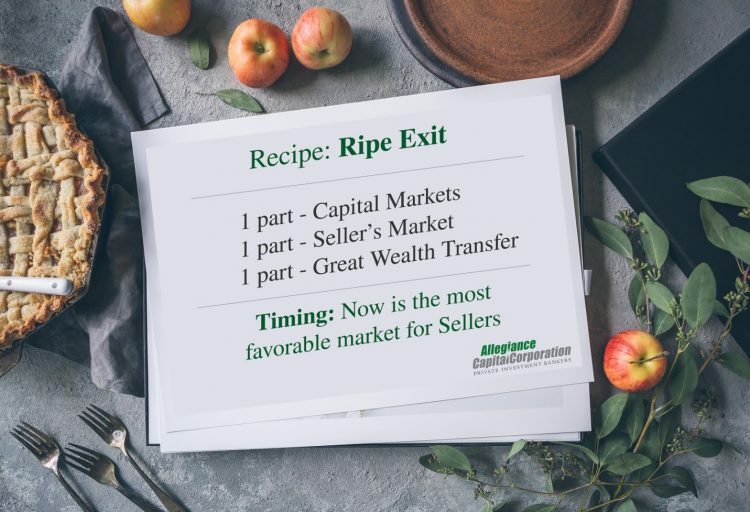 Ideally, a business owner should look to maximize his or her exit with strategic timing – selling in a more favorable market. As discussed in this article, there has never been such a high magnitude of pro-seller events converging all at once. Based on the deal market cycles as shown in Figure 3.0, we may be entering a buyer’s market in the near future. A buyer’s market means there is a higher demand for investment capital because of supply – there are more businesses in pursuit of a limited amount of capital. In this type of market, buyers have the weight of the leverage and possess the power to buy at lower valuations. Whether the current market is a ‘seller’s market’ or a ‘buyer’s market’, demand can be generated by experienced investment bankers. 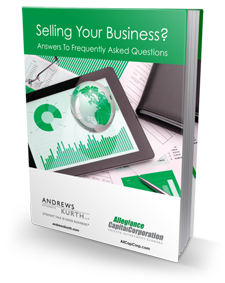 To learn more about market creation and generating demand for private companies, see our article on the subject here. As Baby Boomers began to retire in 2011, they started divesting their business interests. As a greater number of baby boomer owned businesses enter the market, there will be a shift towards a buyer’s market as there will be more businesses seeking a limited amount of capital. As mentioned in the opening of this article, the activity in the M&A market today suggests we are in the midst of an inflection point. The key three ingredients – the capital markets, the current market cycle, and the great wealth transfer – project a yield of extremely favorable returns for business shareholders inside the market’s current window. Due to the current levels of GDP growth, unemployment rate decline, wage growth, and inflation fears, a rise in interest rates is imminent, which means investors will not be willing to pay the premiums they are paying today for businesses. Additionally, the expected flood of businesses coming to market from retiring Baby Boomers emphasizes the importance of strategic exits. If a business owner is on the fence about “taking chips off of the table”, he or she may want to reconsider as it could be another 7-10 years before the markets are in his or her favor again. Global Credit Research. “Moody’s: U.S. corporate cash pile to rise 5% to $1.9 trillion in 2017; tech sector dominates again.” Moody’s. Print. 20 Nov. 2017. Sankaran, Ameeth. 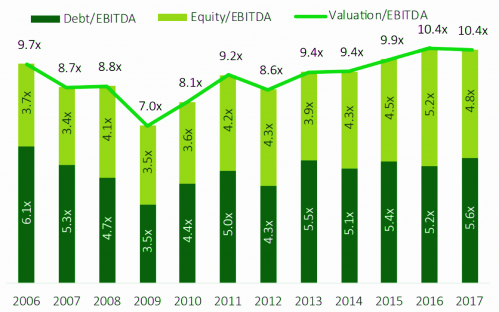 “Is family office ‘patient capital’ more helpful than Venture/PE funding?.” Medium. Web. 14 Jul. 2016. Hinderstein, Chase. “The Effect of Interest Rates on Market Valuation.” The Wise Investor Group. Web. Retrieved 18 Mar. 2018. Slee, Robert T. Private Capital Markets, Valuation, Capitalization, and Transfer of Private Business Interests. Publication. 31 May 2011. Robaton, Anna. “Preparing for the $30 Trillion Great Wealth Transfer.” CNBC. Web. 30 Nov. 2016. Cuneo, Chris. “The Numbers Don’t Lie.” Lindquist & Vennum LLP. Print. 12 Jul. 2016.